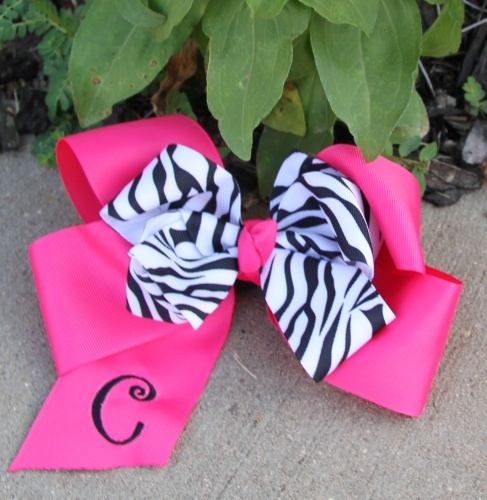 Hot pink and Zebra print all wrapped up in one cute little bow. This is a double stacker bow both made out of grosgrain ribbon. The bottom is a hot pink 2.25" stacked with a 1.5" zebra print bow. The center is wrapped with the same hot pink ribbon and it is attached to a French clip. Add on an embroidered first initial as pictured above, it is done in black in a Mono Curls font. If another color for the bottom ribbon may be preferred, please just state at check out in notes section and it can be done to your specific needs.